Lessons from a Leper (Luke 17:11-17) | Joe Quatrone, Jr.
Posted on September 16, 2013	by Pastor Joe Quatrone, Jr.
As we study the New Testament, we find Jesus performed many miracles and spoke many parables. Always take time to pause and look below the surface of the Scripture because there is a miracle hidden in every parable, and there is a parable to be found in every miracle. On the surface, Jesus heals ten men of leprosy and only one returned to thank Him. But in addition to this miraculous healing, there are some valuable spiritual principles to be found. I want us to look below the surface because there are at least seven important lessons we can learn about ourselves from this passage. In biblical times, leprosy was a terrible problem. The word was often used to describe a variety of skin diseases, but doctors believe most of the people suffered with what we now call Hansen’s Disease. It starts with a white patch of skin that becomes numb, so much so that the victims cannot even feel a needle piercing the spot. The patch begins to spread all over the body and often manifests itself on the face, so the disease is impossible to hide. It then begins to form spongy tumors on the face and, at the same time, attacks the internal organs as well. The nerve endings become numb so the victim cannot tell when something is hurting him, like fire burning his hand. The leprosy itself was not fatal, but more lepers died from other diseases they contracted because of their weakened condition. Lepers were called “the walking dead,” and were kicked out of their homes and villages and forced to live in colonies with other lepers. They couldn’t work or worship at the temple. Even though none of us have leprosy, that’s a good description of us. We are all born with a deadly disease the Bible calls terminal sin; it causes us to be spiritual outcasts. It’s part of our genetic code. I got it from my parents who got it from their parents, and it goes all the way back to a couple named Adam and Eve. You may feel healthy today, but if you don’t have a personal relationship with Jesus, there is a terrible, invisible, insidious cancer growing inside your soul. No MRI, CAT scan or other diagnostic tool can find it, but God’s Word says it’s there. What are you going to do about it? Peter who was always shooting off his mouth blurted out, “Lord, if it’s really you, tell me to walk on the water with you.” Jesus said, “Come on!” Now here is a picture of faith: Peter threw his leg over the side of the boat and started walking toward Jesus. Faith is walking on the Word of God. Faith doesn’t need any evidence, it simply obeys. The Bible is full of God’s directions on how we are to live, and with every single directive, He also provides the power to accomplish it. Our job is to step out in faith and simply obey Him. What is God telling you today to do? What are you waiting for? Step out in faith and obey Him, and only then will you experience His mighty power. On the way to the priest, the ten lepers began to look at each other and suddenly they realized they were healed. Can’t you see them jumping up and down hugging one another? But we know from Jesus’ response only one of them did the right thing. He wasn’t content just to go to church and see the priest, he turned and ran back to Jesus and fell at His feet to give Him thanks. He wanted a relationship, not a religion! Falling at someone’s feet is a picture of submission and worship. Mary spent time at the feet of Jesus when He came to have supper at her house. The woman at Simon’s house spent time at the feet of Jesus washing His feet with her tears. In the book of Revelation, the 24 elders, who represent all the redeemed of all the ages will bow before the Lamb who is on the throne. It is good to spend time at Jesus’ feet. Here’s the key lesson of this passage: ten men were exposed to God’s power, but only one sought a personal relationship with Him. Nine of them were content to receive the blessing of God, but only one of them cared enough to return to the source of the blessing to worship God. That’s so true today as well. God’s blessings are poured out on all people, not just His children. Jesus said God makes it rain on the just and unjust alike. But only a relatively small group of people are interested in having a personal relationship with Jesus. Have you found you only come to God when you have a shopping list of prayer request? Or maybe you use God like a heavenly 911 call? “Help, God I have an emergency, bail me out!” God loves you and wants you to spend time with Him. He desires for you to worship and fellowship with Him. I believe God is still saddened by how few people actually express thanksgiving to Him. Many Americans are too busy to stop and acknowledge God and simply say, “Thank you.” Or they have convinced themselves they deserve everything they have, so why thank God? Some people may laugh at that line, but I think it reveals a real problem many people have. They live their lives enjoying the blessings of God, but never once stop to say “Thank you.” They are just like the old pig who sniffs among the acorns on the ground, but never once looks up to acknowledge the tree that produced the acorns. The Bible says in 1 Thessalonians 5:18, “Give thanks in all circumstances, for this is God’s will for you” (People often ask me, “How can I find God’s will for my life?” You can start by reading His Word, and this verse says clearly and plainly God’s will for your life is to give thanks in all circumstances. If you aren’t obeying that portion of His will for your life, what makes you think He’s going to reveal any more than that? The key is to give thanks, not merely to feel thankful. Now, I’m certain the other nine lepers were thankful about being cleansed. How could anyone not feel thankful after being healed of a deadly disease? But only one of the ten did the right thing by coming back to Jesus and expressing thanksgiving. There is a tremendous difference between simply feeling gratitude and expressing gratitude. Let’s say someone does something nice for me, but I just think to myself how thankful I am for what so and so has done for me and don’t acknowledge that person. If that is all I do, I miss a chance to be a blessing to that person. But if I write them a thank you note, or speak to them and say, “I really appreciate what you did for me,” then they are blessed, too. 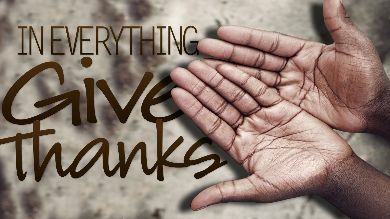 With God, don’t just feel thankful: Give thanks! The Bible says in Hebrews 13:15, “Through Jesus, let us continually offer to God a sacrifice of praise–the fruit of lips that confess His name.” It says “the fruit of lips” not “a warm, fuzzy feeling in your heart.” Don’t just feel it, tell God how thankful you are. But we are not just to thank God for the good things in life. We are to give thanks in all circumstances. Whatever happens, we can always find something for which we can give God thanksgiving. If you are going through a time of pain and difficulty, why don’t you try to find at least one thing about your situation for which you can thank God? I’ve often wondered as I read about this healing of the ten lepers if Jesus was trying to tell us about 90% of us don’t thank God enough. Don’t be like the unthankful crowd. Determine that you are going to be like the one man who returned and gave thanks to Jesus. Jesus pointed out that the one man who returned was a Samaritan–a foreigner. He acted differently than 90% of the lepers. There is a powerful lesson here: those of us who have entered into a relationship with Jesus don’t act or think like other people. We are always in the minority about the way we act and think. We never quite feel at home in this world, and we shouldn’t. The Bible says, “Our citizenship is in heaven. And we eagerly await a Savior from there, the Lord Jesus Christ” (Phil. 3:20). It doesn’t matter where you came from; it’s your destination that is most important. Although we are citizens of America, our main citizenship is in heaven. That’s why Christians often feel like foreigners in this place. This world is not our permanent home. Are you homesick for heaven? Peter writes: “I urge you as strangers and aliens in this world to abstain from sinful desires, which war against your soul” (1 Pt. 2:11). Just as this one man, a foreigner, acted differently from the crowd, so should we. A marching band was performing in a parade. All the band members were walking in perfect rhythm except one guy who was totally out of step. Upon closer examination, you could see wires running to his ears. He was plugged into his walkman and it was playing a different tune than everyone else was hearing. That’s a picture of us: we are marching to a different beat than this world because we are listening to different music. Look again at Jesus’ final words to this man in verse 19. He said, “Rise and go, your faith has made you well.” Concentrate on that last word; it’s the word sozo which means “saved.” It’s the same word the Philippian jailer used in Acts 16 when he said, “What must I do to be saved?” The word means to “be made complete or whole.” Jesus didn’t just come to earth to heal people of diseases; otherwise He would have established a hospital. He came to this world to seek and to save the lost. He came to make people whole. Here’s the result of this miracle: Ten men were cleansed, but only one man became “whole.” Ninety percent of them only received a small portion of what could have been theirs, and only one received full salvation. Friends, Jesus wants to do more than just clean you up. He wants to make you whole and complete. Have you simply approached Jesus because you wanted eternal fire insurance, or are you continuing at His feet daily so He can make you whole? I don’t know why you came to church today, but I do know why Jesus showed up here: He wants to make you whole! We all have a deadly problem only Jesus can fix. This entry was posted in Book of Luke and tagged Bible, Faith, God, Healing, Jesus, Miracle, problems, Salvation, Sin. Bookmark the permalink. I was sitting on my couch thinking about my past. I don’t want people to think I am bragging, but God has made me the woman that I am and here is how. my home and family. I still saw my son when I moved to Florida. He came for visits. My daughter came a few times, as she was in college. Before all this, I had a nervous breakdown, anxiety attacks where I couldn’t stand up, and wanted to die. I hear God’s voice, or His angel say to me one day when I was i want to commit suicide. He said, “Rita, I won’t let anything happen to you.” After I received some of my alimony, I lived on the beach, then bought a condo and after a year a half lost everything. This was the second time I lost everything. My car, my home all gone. I became homeless, living on the street. I was in and out of shelters. They don’t let you stay very long. I was ready to give up. I met a man (demon #1) I met a pastor and was given love and comfort and was and was shown how to pray ..we prayed every day at noon when I wasn’t working out of the labor halls. I stayed with him for a couple of years. One night he got drunk and I ran into the bedroom and he took a hatchet and was cutting the door down. The neighbors heard the noise and called the police, Thank God! I put him in jail, but I couldn’t afford the rent, so I asked for his release. I called my daughter one day and she said to find an apartment and leave him and she would pay my rent with her leftover college fund. I found a job and began to breath again. During this time, I found a church that supported me and gave me peace and love. Two years later I lost my job, my apartment and was on the verge of living back on the street. I called a friend from highschool and he said if I could get enough money together I could live with him for awhile in California. I had a bake sale and made $200 and the church gave me $100 and I sold everything in my apartment. I had just enough money for a plane ticket and flew out to California. I found out that my friend had a mental illness after I got there. I had nowhere else to go. When My daughter called, I wept. I had saved enough money to fly back to Ohio. When I got there, she helped me find an apartment and I babysat my grandson for the year she began a new job. My daughter is my angel. I took computer classes and moved again to a nicer apartment and my daughter encouraged me to write a book and have it published on Amazon.com, which I did. My fan page on Facebook is Rita D. Palmer. I am now working on my second book and getting ready to move into a home. It has been 20 years since I had a home. I was saved in 2007. The story is about a woman who was made strong because of God and her faith in Him. Jesus walked with me through every event in my life. I could have been killed many times. But He was there, talking to me and walked next to me through my journey. He is with me every day. I have found love and joy that I never knew existed. My last pastor to find is Pastor Joe Quatrone. These pastors, my daughter and The Holy Trinity has lifted me up and made me proud of who I have become. Great leassons. God bless you for sharing. Thanks for this wonderful post! I had just finished reading the book of “Luke” along with *Jon Courson’s* Bible Commentary guide. We all who believe can take comfort in knowing we have a Beautiful place to go after all the suffering, trials and tribulations of this LIFE here on earth! It was the Gift of God to send his only son to DIE on the cross of Calvary for all the Sins of Humanity, or back then, Lepers. As I walk by Faith, not by my own Sight, the lord has performed a *MIRACLE* in MY LIFE 6 1/2 years ago when I entered Recovery from Addicted Gambling, and suffering from Mental & Emotional illness. I truly am HIS WALKING MIRACLE…..Praise the Lord! Thanks Catherine. Praise God for your healing! Wow!! If I could give you a standing ovation I would! Amen! God has gifted you brother. Thanks for sharing. Your mention of the Simpson’s “prayer,” reflects a real situation I learned about. A former business associate of my husband’s, who turned out to be a crook, got upset when his son asked if they could thank God before their meal, as he saw at a friend’s house. The man told his son, “I worked and bought this food, so you should say thank you to me, not to God.” I suppose that blindness kept this man from seeing that even his ability to live long enough to take a bite of the food in front of him, for which he was not thankful for, was only by the mercy of the one who gave him life. That reflects far too many real situations, unfortunately. God bless! “He wanted a relationship, not a religion!” It’s easier to brag about what a change we’ve made in our lives than to credit the Healer, Saviour. May you see many people relate to God, and nobody who relies on ritual or tradition! Thank you for your message Pastor Joe, like many of your other ones my heart was uplifted and as I reflected back on my life I could see the Truth of your words. Looking back without fear or shame because I know I have been forgiven but I see even as a Christian, at least in my head if not my heart, I can see that I never really thanked God until I came to heart repentance after falling into sin, to be honest I was in darkness and did not even see my sin, I blamed others or justified the wrong I did. Did I get hurt, yes like the Prodigal son I reaped what I sowed… God says don’t! but I did. I also didn’t take time to smell the roses, it was not till after repentance and when I started to create Power points and e-mails that I realized the beauty of God’s awesome creation and gave Him heartfelt thanks in tears for His Love which was so evident in it , how could I have been so blind but I was, the things of this world clouded my focus. Now I often give Him thanks, sometimes for the beauty of a flower, sometimes for the beauty I see in others, are they always Christians, by their own confirmation in words Not yet but by their kindness I can see The Holy Spirit working in their life, drawing them to heart repentance and so I rejoice and give thanks as I share with them the Hope I have. I know Satan cannot do anything that is good or shown by The Fruit of The Spirit, when He comes as an Angel of Light it is to present what God is opposed to and regardless of how good it sounds, it leads to spiritual death of the soul. He knows those who are his and uses them to achieve his evil plans for mankind, to deceive those who are God’s children in Faith. Things like the teachings of the Occult, New Age, Cult Teaching and Pagan deities, if we listen we become polluted. What are we to do with our Flesh if we are to reckon ourselves dead to sin instead of walking in it. Galations 24 -26 And they that are Christ’s have crucified the flesh with the affections and lusts. if we live in the Spirit, let us also walk in the Spirit. Let us not be desirous of vain glory, provoking one another, envying one another. Romans 8 Therefore, brothers, we have an obligation—but it is not to the sinful nature, to live according to it. or if you live according to the sinful nature, you will die; but if by the Spirit you put to death the misdeeds of the body, you will live, because those who are led by the Spirit of God are sons of God. very good read….until now, I had never thought that there was a difference between being thankful and giving thanks – now I do, thanks and God bless!